Brandon Williams, through his Brandon Williams Economic Development Corporation, is planning an amazing event for St. Louis called Venture Draft. We love St. Louis, their thriving tech and startup community is starting to catch on like wildfire and in fact they’ve moved from the 49th city in the US to start a new business to 6th in just one year. That’s amazing. What else is amazing? How about the line up of speakers, investors, and entrepreneurs that Williams has assembled for the event going on at St. Louis’ Anheuser-Busch Auditorium next week on the 10th and 11th. 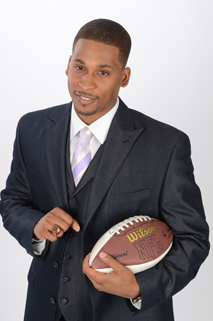 Williams, who is an accomplished professional athlete, having played on a variety of NFL football teams including the St. Louis Rams, has tackled (you see what I did there), the task of helping to spread and enrich the world of startups and entrepreneurship in St. Louis. Williams has assembled Venture Draft to be the crossroads between professional athletes and celebrities and the tech and venture community. All the while, making sure an event of this size and nature happened right in his hometown. Our good friend Gable Lozano is taking a quick break during a coast to coast fundraising trip to speak at Venture Draft. Also, FUBU founder and ABC Shark Tank investor Daymond John will be there. Successful startup founders like Henry Wong a partner at Garage.com; Maurice Lopes, CEO & CoFounder at EarlyShares, and Seth Burgett CEO at Yurbuds are just some of the great speakers slated for next weekends event. Judy Sindecuse, CEO of locally based Capital Innovators, and even William Crowder from Philly based DreamIt Ventures will represent some of the best accelerators/incubators in the country (and everywhere else) during the event.